The last spread of this Black Creek Pioneer Village album had to be the best wedding image of the big day. As such, I went all out. First, I asked the couple to leave the reception. In the background one can see the Event Pavilion and the guests dancing the night away. For this shot, I asked the bride and groom to hug each other and stand still in front of the venue. Next, I applied my special sparklers technique. 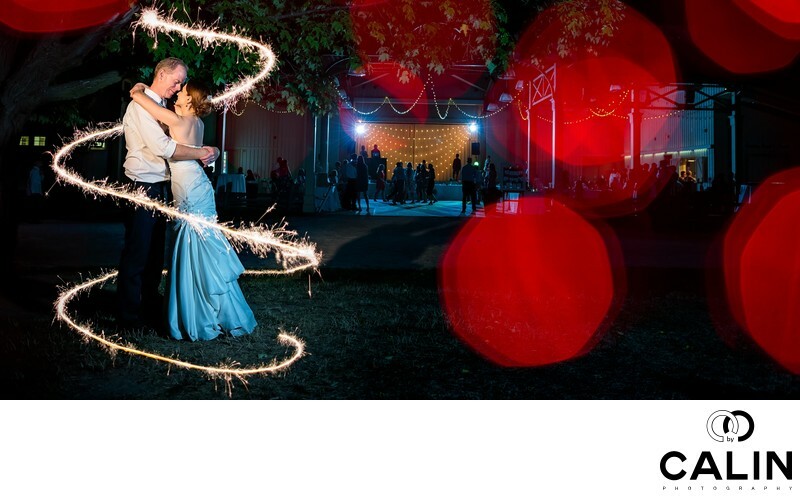 It is an effective way to create a sparklers spiral around the bride and groom. The final element that gives the image originality are the huge globes of lights. They are created through a specific photography technique. Using a prime lens and placing a set of Christmas lights in front of it, one can obtain a very special bokeh and a splendid photo. Every single element in this image taken separately does not make a great shot. However, in conjunction, they contribute to the creation of a priceless photograph that tells the story of the wedding day in one image. As a Toronto wedding photographer, I know my competition is always looking for new ways to differentiate itself. Some of my colleagues are good that capturing moments during the ceremony while others are better at taking bride and groom portraits in the gardens. My goal is to always deliver my clients unique images no matter of the place and time of the wedding day. When I presented the album to the couple, their spontaneous reaction told me I succeeded. "Wow", they said! How did you do this? "I used magic!" I replied jokingly. In all honesty, wedding photography is a combination of talent, eye for details, great technical skills and a bit of magic.